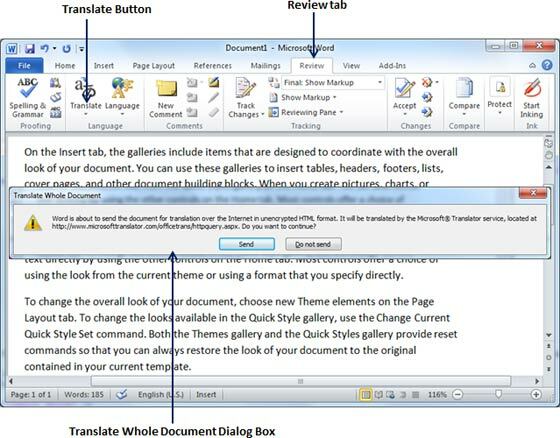 Microsoft Word has an option to translate complete word document from one language to another language using simple step. Let us learn how we can translate document content from English to some other language (Spanish). 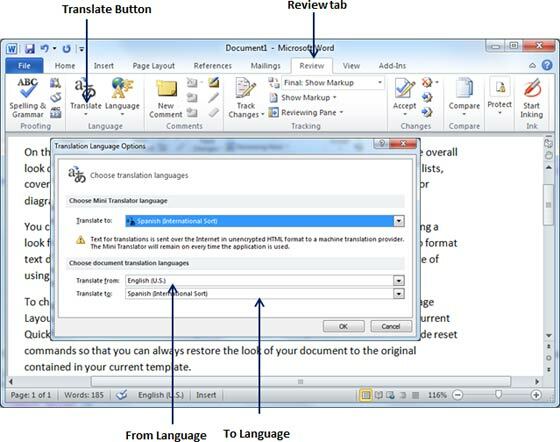 Following are the simple steps to translate a document from one language to another language. Step (1): Click the Review tab and then click Translate button which will display different options to be selected. Step (2): Select Choose Translation Language option simply by clicking over it. This will display a Translation Language Options dialog box asking for selecting from and to languages. Here From is the source document's language and To is the target document language. Step (3): After slecting From Language and To Language, click OK. Now again go to Review tab and then click Translate button which will display different options to be selected. 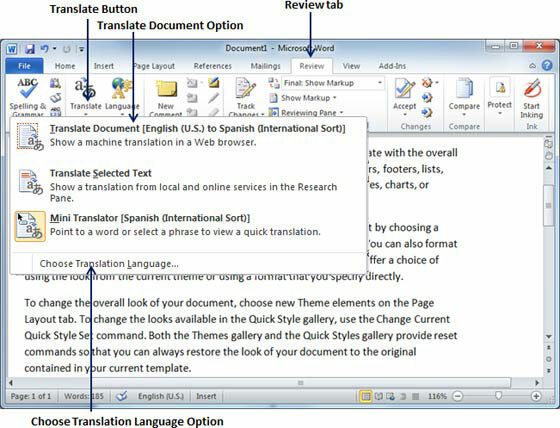 Select top option Translate Document option from the given options, this will display Translate Whole Document dialog box asking for your permission to send your document over the internet to be translated by Microsoft Translator. Step (4): If you are willing to translate your document then, you can click Send button which will send your document over the net to be translated and you will have your document translated in your target language. Step (5): Now you can copy your translated content manually in any other document and save it for final use.